Before I discuss my goals concerning my spiritual tradition, I thought it might be helpful to introduce the tradition itself. I had planned to post an intro in early January or February. Oh well, better late than never I say. This piece is drawn from a longer document, and it retains some of its mystical flavor. I had thought at first to edit it further, but decided to keep it because it makes my heart sing. I hope you enjoy it. The tradition that supports the Reflections Mystery School is called the Order of the Elemental Mysteries or OEM. It is a mystery tradition that weaves wiccan, magickal and shamanic themes together around a mystical core. OEM seeks to create, via its guild system, four semi-autonomous “religious” orders. 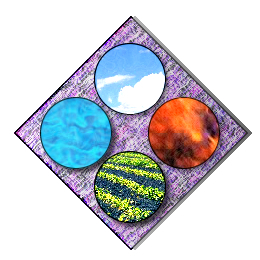 The four guilds, when launched, will act as elemental anchors for the tradition and assist its members in exploring how the work of their respective archetype informs and nurtures their respective paths. The OEM is interested in elements, such as air, fire, water and earth. But we are also interested in elements such as the sun, moon and stars, in the dark and the light, and in the primal energies these all represent. We are interested in foundational truths, energies, cycles and currents that run throughout life, as we know it here, in our living planet-wide ecosystem. But we are concerned not just with our own planet; we are interested in life in all forms, manifestation in all forms and evolution of all types. Our interest however is always from the perspective of how does this help us in our very human evolution. What lessons can be learned, what solutions can we mimic, and what patterns can we discern in order to assist our own growth and healing. In this way we try to engage with the ancient elements of our ancestors. These ancient, eternal elements exist outside our human evolution; they have their own journey and expression. Humans have generally lost touch with these ancient and potent powers. The inert elements we tend to associate with these primal powers are simply the edges of our perception. It is what we can decipher within our narrow human scope and scale. We do not define them nor can we comprehend them in their macro sense. The closest we have come is classic correspondence systems like the Hermetic Tree of Life and the Taoist teaching concerning Yin/Yang. But even these have been contaminated with the religious formalisms and systems of privilege, values and prejudices of our patriarchal cultures, both east and west. This tradition is about getting back in alignment with the ancient lessons, striped of its rationalizations and tortured logic. And how do we find our way through this warped human inheritance? We walk slowly and with intention; we listen and respond to the deeper call within the pulse of life. The pulse echoed within our blood. We steer with the flowing fire, the ancient pulse of energy sometimes called Kundalini or Chi. We allow the ancient cultures of the greater than human realms to gently blow us back on course. We descend into the ancestral currents within our bones and follow the threads of geological resonance back to their source. We re-member. We open ourselves to the divine while sinking ever further into our humanness. We evolve. We cooperate with our own evolutionary path. We walk toward the source, the self and the great goddess that is all. And we join the universal dance of life. Our workings are simple and powerful. We allow divinity to move us, to guide us and ultimately to transform us. We open to the mystery within the so called mundane. We pay attention. Almost anything can be a teacher, any pathway a magickal journey, and every breath an eternity. We are true to our nature, honoring our limits as well as our mastery. Our humility is borne from continuous study and practice. Our scholarship is borne from playful experimentation. Our artistry is borne from patient repetition. And our focus comes from a deliberate surrender to the now. We claim no lineage to ancient temples on the plains of Africa or in the hills of Greece. We claim no lineage to the green mantels of the sacred isles. We did not descend from the holy mountains nor arise from the shimmering seas. We are new and old. We claim that our practices are ancient, not because we inherited them in some unbroken line. We know that they are ancient because they speak to the ancient echoes within our flesh. We claim that our ways are foundational not because we were touched or initiated within an indigenous rite. We claim it because it mirrors practices still practiced the world over by those who have not lost their connection to the ancient promises. In fact, we ask no special right, we make no claim to land or language. We simply act in concert with our deep sources to help make ready the world for the next step in the evolution of the human species. And we are not the only ones working in this sphere. We recognize the divine impulse in all traditions, in all cultures and on every continent. Ours has a wiccan flavor, but others are Catholic, Protestant, Islamic, Buddhist, Hindi, Dine, Dagara, Maori, and numerous indigenous paths worldwide. We are all trying in our own way to re-open pathways that have become closed within human consciousness. We are re-kindling the human capacity to grow and change. It shows up in popular culture in films such as the Matrix, The Lord of the Rings, and Star Wars. It shows up in anime as robots and monsters working in concert with humans. It is played out in music genres as hard rhythms layered with higher frequency sounds such as string instruments, flutes and vocals. We see it in architecture as we cycle between rectangular boxes and sweeping arches. Our clothes reflect the same tension, short with long, plain beside brightness, and narrow against fullness. Even our languages struggle as we blend and separate them, cycling between cooperation and demarcation. Fundamentalist the world over identify with the light while casting all others into the dark. And also the world over, the young and growing grasp the darkness and spurn the light. Humankind is lurching forward on the path and we are kicking and screaming all the way. The elemental archetypes can help us through this journey. And this tradition evokes them into the human oversoul. We call forward the primal currents and we use them to both hasten and calm a storm that will run its course for at least the next four hundred years. Thanks for sharing this. I've gotten hints of this from Angela over the years, but I'm really happy that you've come full-circle enough to decide to share all of this publicly. Many blessings on this new branch of your path! Fantastic to read about your tradition - glad you've posted!